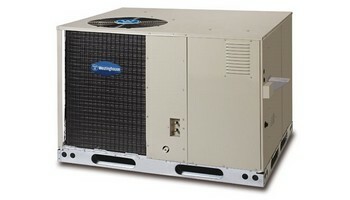 Westinghouse 14 SEER, P7RE Packaged Air Conditioner Quality Compressor: State of the art compressor is standard equipment. • Hi Pressure Switches: Ensure long compressor life. • Micro-Channel Coils: Both indoor and outdoor all aluminum coils are designed to optimize heat transfer, minimize size and cost, and increase durability and reliability. Eliminates corrosion. • ECM Blower Motor: Fixed torque energy efficent brushless DC ECM motor. • Permanently Lubricated Condenser Motor: A heavy duty PSC motor for long lasting reliability and quiet operation. Requires no maintenance and is completely protected from rain and snow. • LowVoltageTransformer:Includes 3 Amp fuse to protect low voltage circuit. • LiquidLineFilterDrier: Factory installed at a convenient location for service. • Designed Using Galvanized Steel: With a polyester urethane coat finish. The 950 hour salt spray finish is 1.5 mil thick and resists corrosion 50% better than comparable units. • Compact Footprint and Profile: Make the P7 Series easy to install and transport. • 0” Clearance: To combustibles on duct side of the unit allows for installations in tight areas. • Wire Guard Coated with Earth Friendly Epoxy and Plastic Mesh Hail Guard:: A guard that will never rust and protects the units coil from being damaged. • Raised Base Pan: Allows water to drain away from the unit. • Easy Compressor and Control Access: Designed to make servicing easier for the contractor, access panels are provided to all controls and the compressor from the side of the unit. Hi/low service ports allow access without disrupting operation. • Easy Access: To the evaporator coil for cleaning, blower assembly removal and general maintenance. • Drain Trap: Design optimizes drainage capabilities. • Removable Top Grill eAssembly :Allows ease of service to the fan motor. • Optional Electric Heat: Field installed 5 – 20 KW. Coil Leaks Avoided: Westinghouse packaged equipment guards against coil leaks with two corrosion-resistant coils.Guards Protect Interior: Both a wire coil guard and a never-rust mesh hail guard help protect the interior of this packaged unit from damage caused by balls, lawnmowers, hail and more.Backup Heat Option: With this packaged air conditioner, you can enjoy 20 kW of emergency backup heat supplied by an electric heat strip.Galvanized Steel Shell: This unit is designed to last and last. In fact, it is built using galvanized steel coated in a polyester-urethane finish that helps the unit resist corrosion.Ensuring Premium Quality: Each packaged air conditioner that leaves a Westinghouse factory is checked 72 times at every stage of the manufacturing process to ensure quality.